After getting soaked by the rain in Okayama, Lea and I headed for Kurashiki and Ryokan Yoshii, where we would be staying. 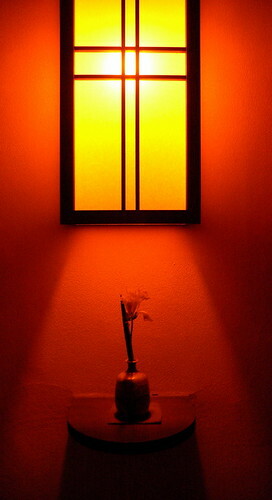 Ryokan are traditional Japanese inns that are famous for their service, hospitality, and kaiseki dinners. The trade-off, a bit like a bed-and-breakfast in the States, is that you can’t treat a ryokan like a hotel — the ryokan experience is supposed to be as much a part of the trip as the trip itself. There are also certain rules and procedures associated with staying at a ryokan, though these end up making the experience pleasant rather than programmatic as far as I’m concerned. In any case, our stay at Ryokan Yoshii was totally fantastic and I can recommend the place to anyone. After taking our shoes off in the genkan of the ryokan, we were shown to our room — a beautiful tatami room with a gorgeous table in the center of the floor, a small veranda with a table and two chairs that looked out onto a beautiful Japanese style garden, and a small display of hina dolls in the tokonoma. At this point we signed the guest register and were served tea. My Japanese is not so good, and the staff at Yoshii didn’t speak any English, but they were just incredible at making sure that everything was clear to Lea and I, while at the same time making sure that it was known that Yoshii was a casual and comfortable place and that we didn’t have to stand on formality. Of course, the first thing you do at a ryokan is change out of your everyday clothes and into a yukata, which is basically like a bathrobe or ‘pajamas,’ except you can wear yukata in public. In fact, the yukata is standard wear for summer festivals. 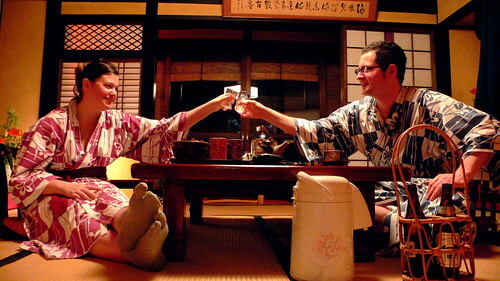 Once you are in the yukata you don’t change out of it the whole time you’re at the ryokan. Since it was still cold out at night when we visited Kurashiki, we even got to wear two sets of yukata — the standard cotton inner wear, and a thicker outer layer which we wore to dinner and breakfast. The other first thing to do at a ryokan is to take your yukata off and jump in the bath. The ofuru at Ryokan Yoshii — at least the one that Lea and I used — consisted of a beautiful stone-lined room with four shower areas to wash yourself off before entering the bath, and then a deep, deep, ceder tub filled with hot, clear water to soak in. The water in the tub is precisely level with the rim of the tub and when you get in, the water you displace washes over the edge of the tub and makes an incredible ‘whooshing’ sound as it strikes the stone floor, scatters, and then runs as a sheet to the edge of the shower area where it pours itself down the drain. As Lea pointed out, it’s precisely the same “whoosh” that you hear in the bath sequence of Spirited Away. And then you relax up to your neck in water that is just hot enough to be a little too hot, but not so hot that you’ll ever consider removing yourself from the water. And after the bath? Beer of course. Served in a beautiful basket that was just exactly the right size for two bottles of Sapporo.